DDB 174C is a Daimler Fleetline CRG6LX with Alexander H75F bodywork. She was new to North Western in 1965. The company was split in NBC days and, so far as I am aware, she became part of the SELNEC fleet, passing to GMPTE when the ‘new’ county expanded to include Wigan. She became part of the GMPTE museum fleet and was one of two vehicles from that collection (the other was a Leigh Renown) which took part in the Southampton City Transport Centenary event, where we see her on Itchen Bridge. The date is 6 May 1979. Pete Davies is correct in saying that DDB 174C became part of the SELNEC PTE fleet. The process though was not that straight forward. I am sure a lot of contributors to this site will know this, but I think it needs retelling. In November 1971, a new company, wholly owned by North Western, was formed in readiness for the impending split up of the Company. The new Company was the ‘North Western (SELNEC Division) Road Car Company Limited’. On the 1st January 1972 this new company took over from North Western the stage carriage services within the SELNEC PTE area, together with Garages at Altrincham, Glossop, Oldham, Stockport, and Urmston (Wilmslow garage had closed on 19th December 1971. On the same date the services in the Biddulph, Macclesfield, and Norwich areas together with the vehicles and garages, were transferred to Crosville Motor Services Ltd.
On 4th March 1972 the properties at Buxton, Matlock, and Castleton, again with the vehicles and services, passed to the Trent Motor Traction Co Ltd.
On the same day the North Western (SELNEC Division) Road Car Company Ltd., passed from North Western to SELNEC PTE control, and was renamed the SELNEC Cheshire Bus Company Limited. Thanks for that, Stephen. As you say, not at all straightforward! These Fleetlines were very cramped internally. There was very little leg room between the seats. 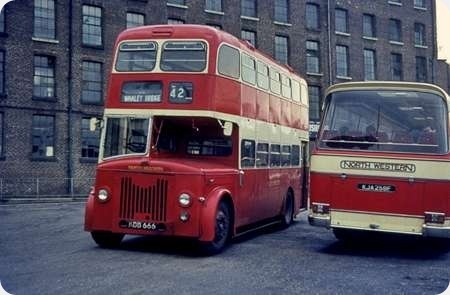 Later when I worked at Rochdale Depot, we had four of these Fleetlines. As a conductor I still found them a bit cramped internally, even though they were the same size as other buses. The gangway was narrow, and the ceilings were low – they were the only low height buses I conducted. Later as a driver, they were very nice to drive, although like all Fleetlines in those pre-power steering days, the steering became very heavy when the bus was full. They would have benefitted from a footrest for the driver’s left foot. On one or two occasions I picked up bricks to use as a footrest. If anyone wants to see DDB 174C Close up she has been on static display At Boyle Street for Sometime now. As if any of us who follow this site would need an excuse to visit. With reference to this posting, I attach a view of DDB174C on Southampton Common the following morning, in company with the Leigh Renown (PTC 114C) and the Merseyside (ex Southport) PD2 open topper, CWM 154C. What a wonderful variety of chassis and body styles our operators had back then! Not to mention a wonderful variety of fine liveries Pete. Indeed, Ian, especially in respect of the windscreen area! I don’t remember Crosville taking over stock from Norwich. Wasn’t it Northwich? Thanks for correcting my typo Woody. I blame the pre-emptive text on my Kindle. Talking of Wilmslow depot (29/09/15, above), didn’t it become North Western’s HQ for a time? If I’m right in this, could someone say when, relative to the other events mentioned? David, I think you are right, but I’m not sure on dates. I seem to remember a day out from a family visit to my grandmother in Bolton in April 1973, when I went to Blackpool on a North Western vehicle, and that had the Wilmslow address. David Call is correct in that Church Street Wilmslow became the Registered office of North Western in January 1972. The slimmed down Company was left as an Express service operator with 84 coaches, a garage at Hulme Hall Road in Manchester and a Travel Office at 32 Merseyway, Stockport. Wilmslow was also George Brook’s office as Regional Director of NBC. The garage was used for storing withdrawn vehicles for a time after it ceased being an operational garage. I do not (as yet) have a date when it finally shut. It was sold for redevelopment. 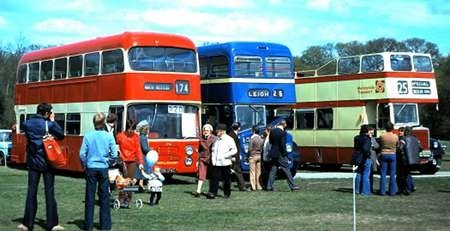 It should also be noted that from 1 January to 3 March 1972 inclusive North Western vehicles operating on local services carried "On Hire to North Western" labels whilst all the legal formalities were carried out. John, that reminds me of the time when the green buses in north Devon carried labels saying, "This is a Red Bus". I once attended a seminar at Aston University where Dr Caroline Cahm (did I spell the surname properly?) was one of the speakers. She related the odd situation in Portsmouth on the first day of "Portsmouth Transit", when a lady with a Southdown pass could not understand why a driver in Southdown uniform would not let her use the pass on a bus in Southdown colours. Politics and politicians – who’d have them? 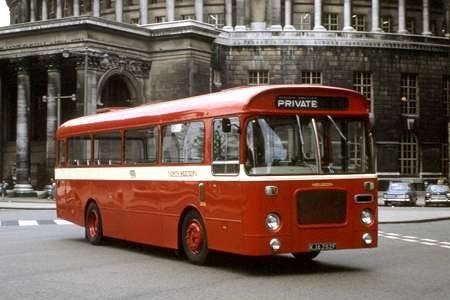 Until the arrival of ten of these in the North Western fleet in 1956, previous examples of the Leyland PD2 had featured traditional exposed radiators and bodywork by either Leyland themselves, or by Weymann, who had supplied six lightweight but otherwise classically styled bodies in 1953. This last batch featured the PD2/21 chassis with the concealed front – originally designed for Midland Red’s LD8 class, then adopted as standard by Leyland, even leaving the oddly shaped blank space above the grille slots intended for the BMMO badge. The PD2/21 was the less common air-braked variant of the more common vacuum-braked PD2/20. The bodywork was the lowbridge manifestation of the MCW organisation’s lightweight Orion, regarded by many as being particularly slab-sided and ugly, though personally I always felt that the equal depth windows (compared with the unequal ones of the highbridge version) at least improved the overall proportions. It seems that they were generally unpopular with crews and most local enthusiasts, being accused of being very hard riding. They were quite a familiar site to me – particularly on Summer Saturdays when the usual ‘blacktop’ Tiger Cubs or Reliances were needed for greater things – as they would often pass through my home town of Halifax working on the X12 between Manchester and Bradford. Although this service passed our house, the limited stop conditions on that section left it out of bounds to us locals, so I never got to ride on one. Although the other nine were scrapped, Neville Mercer has said that 666 was exported to Canada, so there is a remote chance that it could still exist. Similar looking examples were also bought by East Midland, and the Corporations of Luton and Southend. Here 666 is seen on the parking ground off Wood Street in Stockport, alongside 258, a Leopard PSU4/4R with Duple Commander III C41F body of 1968. When I worked at Sharston (near Northenden) 666 from Manchester depot, took me on the first leg of my journey home to Royton. It was on the 64 service to Piccadilly (from Ringway) almost every day. I hated it. The suspension was indeed very hard. I usually sat on the front nearside seat in the lower deck, which was not too bumpy. The North Western drivers always gave me a fast run into town – they made good time by ignoring one or two intending passengers. As for sound effects, the journey was accompanied by sneezing noises from the air brakes! At summer weekends it sometimes appeared on X12, Manchester – Halifax – Bradford. I had the misfortune to ride on it one Saturday from Bradford to Oldham. The West Riding road surfaces made for a miserable journey! Wouldn’t mind a ride on it now though!! John mentions that these lowbridge PD2’s were familiar to him as they regularly passed through Halifax on the X12. This one actually passed through Halifax, Nova Scotia in 1972, on its way west, it certainly took me by surprise when I caught a glimpse of it. I’m not sure if it still exists or not, or just where it might be. The problem of harsh riding given by the lightweight Orion and its clones was shared by other makes of chassis, all of which were sprung to carry the typical weight of traditional, decent quality bodywork. Not only were they hard riding, they were finished to a cheap specification, rattled a lot and the crews hated the rear doors. All in all not the finest NWRCC vehicles. It’s lovely to see a photo of the registration number KDB 666 as nature intended, adorning a North Western Leyland Titan. In the late 1970’s the registration number could often be seen around Harrogate, attached to a very nice green Rover 3500. The bus connection was maintained however, as the Rover was used by one of NBC/West Yorkshire Road Car’s senior managers. 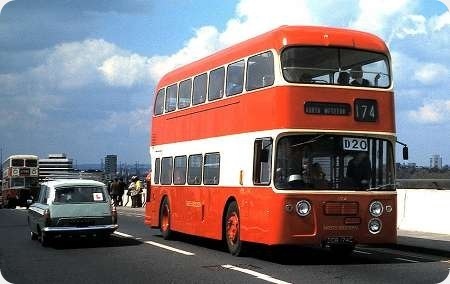 I have a note of seeing this bus in Frank Cowley’s yard in Fallowfield, re-registered KDB 499, in January 1972. I wonder what that mark was transferred from? I’ve long wondered if "KDB 499" was a real registration mark. Given the fundamentalist tendencies of many North Americans I can understand why Cowley (given a Canadian buyer for the vehicle) might have decided to remove the original "Number of the Beast" plate, but would they really have gone to the trouble of officially re-registering it with a similar mark? My suspicion is that the plate was for purely cosmetic purposes. Back in the late 60s I saw a few withdrawn NWRCC vehicles being ferried to Cowley’s Salford and Fallowfield premises using the dealer’s "BA" trade plates, and once the PD2/21 had gotten there its next trip was on a boat. I’d also be interested to find out when the WYRCC staff-car received the registration. Was there a noticeable gap? The PSV Circle’s NWRCC fleet history asserts that KDB 499 was a genuine registration, but as aficionados of these histories will be aware the level of accuracy in this is not up to their usual standard. Does anybody have a record of Stockport registrations? KDB 499 may well have been a real registration mark but not to NWRCC for a PSV. They had KDB 631 to KDB 700, all but 661-670 being applied to Tiger Cub deliveries in 1956 and 1957. Hi Orla, I think you’ve forgotten the batch of Weymann Fanfares that started at KDB 626, making a total of 75 vehicles in the block allocation. KDB 499 was presumably allocated to a private car, and I really can’t understand why NWRCC would go to the trouble of re-registering the vehicle before selling it to Cowley. Back in those days this would have involved buying the previous vehicle to wear the marks – a rather expensive manoeuvre merely to get rid of one old bus. There’s obviously another story going on here – the allocation of 666’s old registration number to the WYRCC staff car. I appreciate that "KDB" looks vaguely like a WYRCC fleet number, but a staff car would look nothing like a Keighley based Bristol double-decker! Why would anybody (especially a no-nonsense THC subsidiary) pay good money to do this? Do we have any ex-WYRCC readers who can throw further light on this? Ah, yes. The AEC Reliances. I had forgotten them. Neville, the senior member of staff arrived in Harrogate from elsewhere in the National Bus Company empire, and the Rover came with him, already bearing its KDB 666 registration. Maybe he had a soft spot for this particular bus (666) or perhaps there was something of significance in the registration. Alas we’ll probably never know. I’ve done some digging in my records and find that KDB 666 was on a Rover 3500 that came under West Yorkshire admin on 16/1/75. However, it runs in my mind that the NBC “senior member” was Robert Brook, and that he didn’t come to Yorkshire to join West Yorkshire, but to live. Certainly, it’s shown as being the “Chief Executive’s” car. At about this time, if you remember, NBC was also running an area office in Darlington, to which Bill Stephen had been “shunted” when he was removed as WY Chief Engineer, but whether that was where Mr Brook also worked I can’t now remember. I suspect he probably spent a lot of time commuting to London! Presumably the Robert Brook who was General Manager of North Western at the time it was broken up? I seem to recall that there was another Robert Brook, although I might just have been confused by rapid ‘career moves’! I remember seeing a beige Rover in Cheadle in the late sixties or early seventies with the reg KDB 666. I loved occasionally having a lowbridge Titan on my journey to school. The routes 29, 30, 52 and 52A were predominantly Daimler Fleetlines, Dennis Lolines 2 and 3 and AEC Renowns (my favourite bus ever was AJA 121B one of the second batch with moquette upholstery on the upper deck) so a lowbridge Titan was quite a novelty. There’s no mystery. Robert Brook was the last GM of North Western and he took the registration with him for his car when he left at the end of 1972. He also left with a photo I prepared for him of 666 as delivered in the old cream roof black wings livery. He and I left the Manchester area at the same time and he kindly let me speak to him in his office knowing my interest in North Western and as owner of CDB 206. I’ve just read through this thread and can definitely clarify, if there’s still any uncertainty, that Robert Brook was overall Chairman of NBC in 1978-80 at a time when Linda Chalker was Minister for Transport. My GM at the time would say ‘Oh dear, we’ve got another Dear Robert, love Linda.’ i.e. another memo from the Minister to our lord and master that had to be dealt with. Presumably Bob B’s ‘left’ didn’t mean retirement, or could have referred to another RB?